September 1921, as a record–breaking heat wave scorches the East Coast, The Golem heads for Manhattan Beach, Long Island. 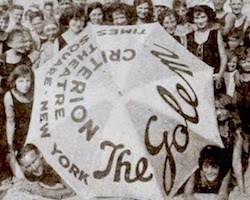 Ads for the Criterion Theater showing of Paul Wegener's THE GOLEM (1920) were painted on rental umbrellas, a high visibility "stunt" aimed at the estimated 50,000 bathers on hand daily. It was just one of many ambitious ballyhoo efforts deployed to promote the film. Pitching the film in the Exhibitors Herald of September 24, 1921, Paramount Exploitation Representative Eli M. Ororwitz suggested that special attention be given to promotion in Jewish communities — "(a) sure-fire channel for exploitation" — but not to limit its reach. "The Golem is screen literature." Orowitz writes. "There is enough curiosity for that sort of thing to make an exhibitor rich, if he appeals to the intelligence of the patrons… The story of "The Golem" can stand anywhere. There is similarity between it and the old Frankenstein Monster legend. It is the perennially fascinating subject of mechanism come to life — the inanimate breathing." Even the film's expressionist style should not be a problem, "The Golem brings a sound futurism to the screen. It surpasses the attempts of one or two other screen endeavours, because it avoids the usual Greenwich Village-Cubist hodgepodge." Take THAT, NOSFERATU and THE CABINET OF DR. CALIGARI! Through the summer and into the fall of '21, THE GOLEM marched through Philadelphia, Chicago and Cincinnati. Patrons were handed playbills, English on one side, Yiddish on the other. In Cleveland, posters were plastered on street cars, bringing "splendid attendance" to Loew's Euclid. In Harrisburg, Pennsylvania, 3500 residents found calling cards in their mailboxes reading, "Dropped in to see you but you were out. See me at the Regent Theater, Monday." In New York, THE GOLEM was given special attention for its extended run at the prestigious Criterion theatre at 44th and Broadway, a showcase for major releases. The film was accompanied by an elaborate live prologue, scored and conducted by Criterion manager Hugo Riesenfeld, featuring songs and scenes of Old Prague. The program also included a Buster Keaton short, HARD LUCK (1921). 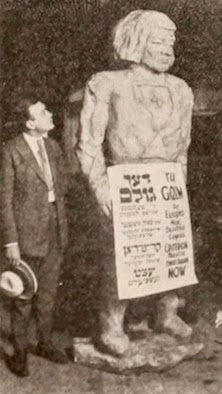 Paramount Exploitation Rep Fred Green, following up on his beach umbrella stunt, commissioned a full‒sized Golem statue, manufactured by the Brunton Studio from a model by Criterion staffer Louis Gardy. Cost was a then steep $50. Reports indicated "increased business far in excess of this amount". Soon, the Golem statue was being trundled around town, up and down the East Side, parked in doorways or standing guard at the Criterion. 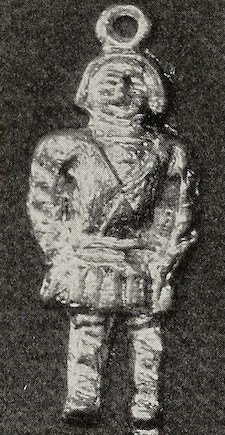 A number of smaller statuettes, roughly 3 feet tall, were made for display in neighbourhood store windows. Still smaller, an inch and a half Golem "watch charm" was cast in — yikes! — lead. The toxic tchotchkes were devised by Paramount exploiteer Albert Boasberg of the Washington exchange and made available to exhibitors at $6.50 for 500, and $11 per thousand. The Criterion's publicity campaign, referred to as "The Golem Drive", proved successful. The combination of poster and newspaper ads, and the accompanying inspired "stunts" translated into serious box-office. 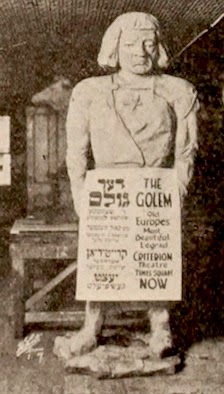 THE GOLEM would play the New York venue for sixteen and a half weeks. Fascinating stuff, Pierre. I thought I was pretty much on my GOLEM-ology (I'm currently reading Other Selves by Nicolella and Soister, on Wegener's fantasy films), but this is all new stuff to me. Had no idea the movie was that successful stateside.